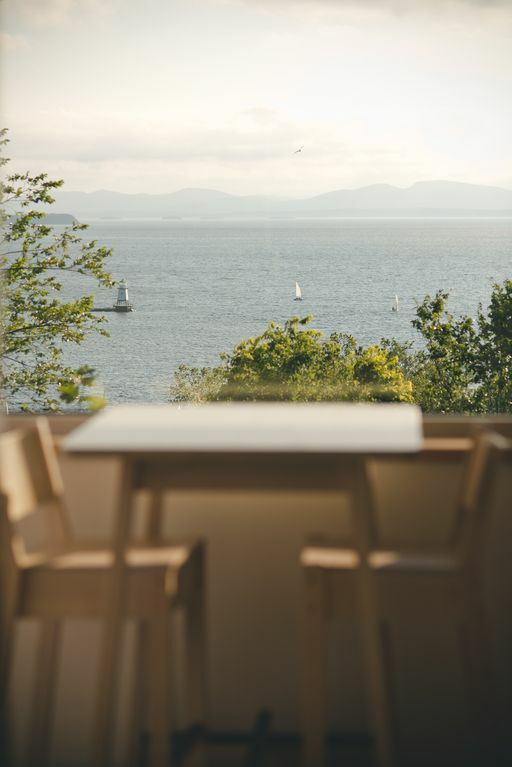 Enjoy one of the finest views of Burlington harbor and its lighthouse from this elegant, contemporary studio apartment situated overlooking Lake Champlain. Located on Lakeview Terrace and close to downtown, it's a fifteen minute walk to historic Church street, a ten minute walk to the renowned 'Hen of the Wood' restaurant - or a 5 minute walk to Waterfront Park and the Lake Champlain recreation path. Explore the city's best restaurants, shopping, culture, and nightlife without getting in your car. Or relax at your intimate table for two as you watch breathtaking sunsets across the expansive view of the lake. This stylish studio apartment includes a comfortable, queen bed, built-in desk, and cozy sitting-area. There's a fully equipped kitchen with all the luxuries of home - a convection / microwave oven, two-burner cook top, dishwasher, and combination washer and dryer. Emphasizing the best of contemporary design and architecture, the space includes custom cabinetry throughout, polished concrete floors, radiant floor heating, wireless Internet and flat panel TV. This studio has its own private entrance and occupies the first level of this landmark lakefront home. Amazing views of Burlington Harbor and the Lighthouse. this rental was the perfect location for access to the bike path, the lake, and downtown. it has beautiful panoramic views of the lake. it is entirely furnished by ikea furniture, which was kind of impressive to see in person. however, the bed and pillows are quite flimsy and if i stay again, i'd bring my own pillows. additionally, i guess we had freak weather and the apartment was amazingly hot, and it would have been nice to be able to cool it down a bit. overall, we'd likely stay again since it was super convenient and the view of the lake was a super pretty way to start the day. Space is beautiful and well designed. Spotless and well equipped. Bed and linens are comfortable. View of the lake is stunning. Perfect location to explore downtown. Owners were great to work with. We highly recommend. Beautiful apartment, wonderful location, incredible view, and a lovely, attentive host. This spot is a hidden gem... I can’t wait to come back a visit! Simply beautiful and a great location! It was perfect for a weekend in Burlington. We stayed with Heather while visiting family in Burlington. First of all, the unit was extremely clean and welcoming with a lovely bottle of red wine waiting for us. While the space is smaller, it's extremely well designed and you've got all you need right there. The view of the lake is as good as advertised!! The location is near perfect; just a short walk to downtown. There is cute breakfast/lunch shop nearby, Nunyuns and a cool neighborhood bar, The Old Northender very close by. And again, the view! Your hosts are very kind and gracious and if there would be any issues (we had none at all) I have no doubt they'd make it right. Highly recommend! Accommodations were great. Very nice place. Burlington was amazing with lots of things to do. Great sights! !